Tonka Kahuna translates to “Great old wise one.” This board can be enjoyed by anyone in the family, and it doubles as a performance surf-style wake surfboard for riders over 180 pounds. Also available in fiberglass/painted construction. The Tonka Kahuna wakesurf board is one of our most tried and trued shapes. 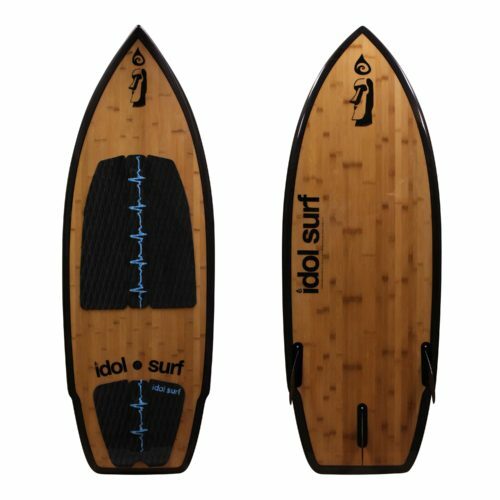 This LE model is wrapped in 100% carbon fiber and bamboo, which is lighter and stronger than traditional fiberglass construction. In its latest evolution, it has become more agile, user-friendly, and faster. This board is ultra-forgiving, and there is no minimum recommended weight to ride it. Because of its wide, stable outline, almost any beginner-intermediate rider can get on this board and have the best wake surfing session of their life. The 5’1” Tonka Kahuna is designed for the tallest wake surfers, and can accommodate riders up to 260 pounds. Featuring a Futures Fins thruster configuration, riders can experiment with fin combinations to find their ideal ride. Thruster (3-fin) set-up is ideal for speed/drive and hold. It can also be ridden as a twin-fin to keep it loose for spinning, or beginners can ride it single-fin for superior stability and tracking. All idol wake surfboards feature light and strong EPS/Epoxy construction, Futures Fins interchangeable fin systems, EVA deck pads, and Gore-Tex passive vents (in surf-style boards only). These boards are made with integrity using quality materials and skilled craftsmanship. CNC machined and hand finished EPS foam core with 3-ply stringer. Two layers of 6oz fiberglass hand laid and wrapped per side, resin-infused and vacuum bagged bamboo, wrapped with a third layer of fiberglass. Topped with hand-laid and cut 3k carbon-fiber rails. All laminated using non-toxic epoxy for superior strength and performance. Fitted with Gore-Tex passive vent to allow out-gassing and avoid delaminating in excessive heat and/or high altitude conditions. 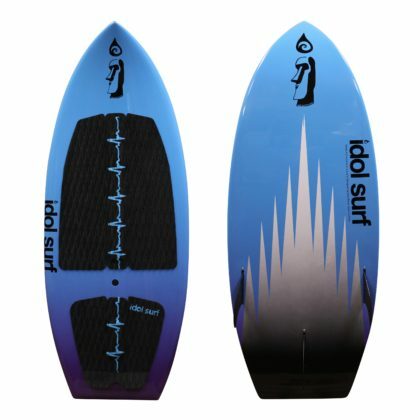 All idol wake surfboards are fitted with idol’s heartbeat EVA deckpad. A fast and stable outline puts board volume between your feet where you want it, and sheds excess foam. 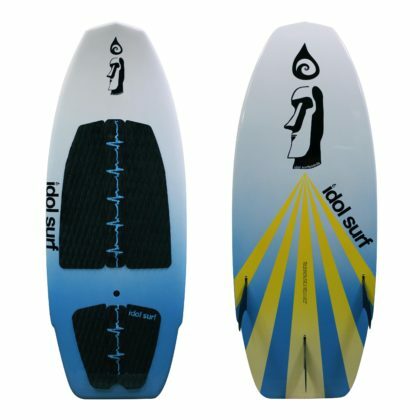 Single-to-double concave work with the thruster fin setup to make this board fast down-the-line. Extra wide squash tail allows you to generate speed off your back foot and turn with ease. Progressive rails hold and drive up front while releasing at the tail for spins and aerial tricks. Futures Fins thruster setup with three fins included. Ride it thruster (3-fin) set-up for speed and hold. It can also be ridden as a twin-fin to keep it loose for spinning, and beginners can ride it single-fin for superior stability and tracking. With Futures Fins boxes, you have the ability to upgrade to any Futures compatible fins for an even higher-performance, pro-level ride. Free shipping on all wake surfboards in the 48 continental United States! Orders ship via UPS within two business days. 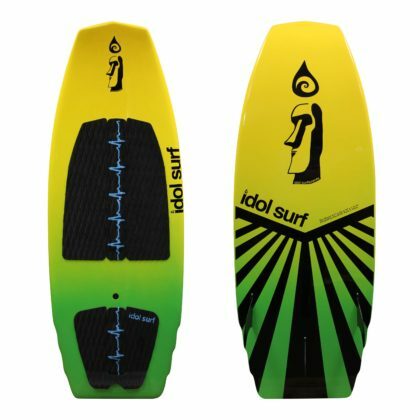 If you want your wake surfboard sooner, check our Dealers Page and visit your local idol surf dealer. 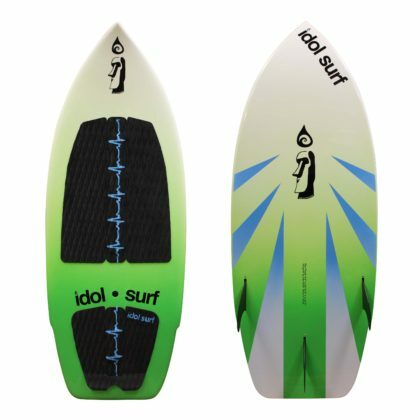 Flattened rocker, thinner/progressive rails, squash tail, deep single-double concave, thruster fins. EPS, Epoxy, Carbon Fiber, Bamboo.